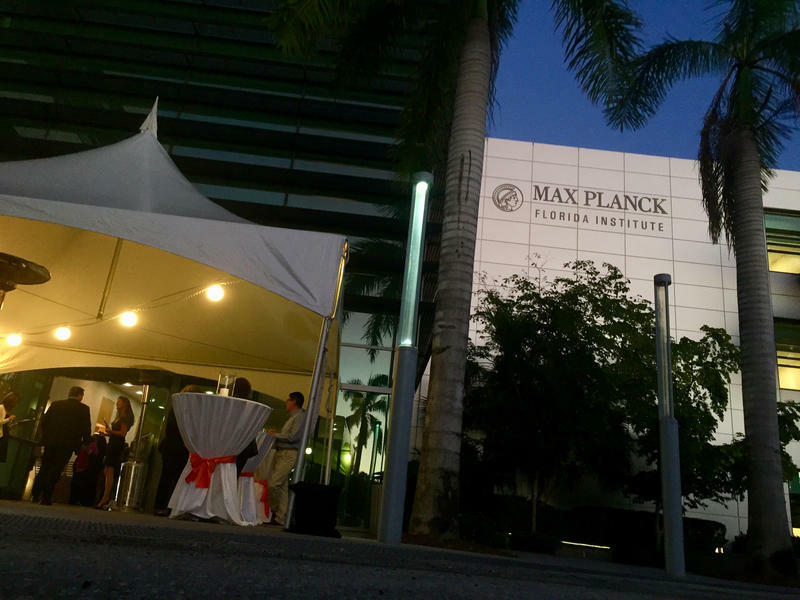 Attendees arrive for the first Science Meets Music event of the 2017-2018 season at the Max Planck Florida Institute for Neuroscience in Jupiter on Dec. 11, 2017. Established in 2010, MPFI is part of a biomedical research hub envisioned by former Florida Gov. Jeb Bush. The cluster includes Scripps Research Institute and Florida Atlantic University’s Brain Institute. State and local government invested more than $185 million to lure Max Planck’s first American venture. Max Planck Society President Martin Stratmann arrived from Munich earlier this month to announce a groundbreaking new partnership with FAU: an undergraduate honors program in neuroscience designed to attract the brightest young scientists to South Florida. Stratmann spoke with WLRN’s Peter Haden about the value of fundamental science research. 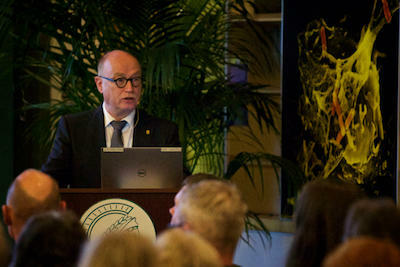 Max Planck Society President Dr. Martin Stratmann reflects on his own path during his presentation, “Driving Discovery: Mankind’s Urge To Understand” at Max Planck Florida Institute for Neuroscience in Jupiter on Dec. 11, 2017. MARTIN STRATMANN: Yes, that’s exactly right. Basic science, as we do it at Max Planck, is not driven by proposals. We give our directors long-term trust. We allow them to do the research they want to do for life, and we provide them with funding for life. This kind of science is good for breakthroughs, breakthroughs which are unforeseeable. To enter the Max Planck Society, that’s really the hard step. We have a very careful search process to look at those people who we think are eligible to be a Max Planck director. That’s a really tough task. Where does the money for the Max Planck Society’s budget come from? The vast majority of our funding is indeed from the German state. Our budget is roughly $2 billion per year — with very few strings attached. And the German state and the German people want to fund this kind of research because…? We give our directors long-term trust. We allow them to do the research they want to do for life, and we provide them with funding for life. This kind of science is good for breakthroughs, breakthroughs which are unforeseeable. The German society knows if you do not invest in education and science, in the end, you cannot be among the top leading nations worldwide. And based on this understanding, there’s a long tradition in Germany of investing in science. You know, our chancellor is Angela Merkel, and she is a scientist herself — a theoretical physicist. So she understands the importance of science quite well. Science is one of the few things that makes us, as humans, differ from all other animals. We are the only species that can understand the world in which we live. If you look at the planet Earth these days, it’s a man-made planet. And that has consequences. Global warming is one example. Biodiversity is another example. Pollution of oceans. Dealing with this planet Earth is only possible on scientific grounds. So science, I think, is a question of survival of mankind in the long term. What’s going on at this Max Planck Institute right here in Jupiter, Florida? It’s one of the institutes we have at the Max Planck Society which deals with neuroscience. They have certain parts of this whole brain-based science business which they concentrate on. One part is vision. 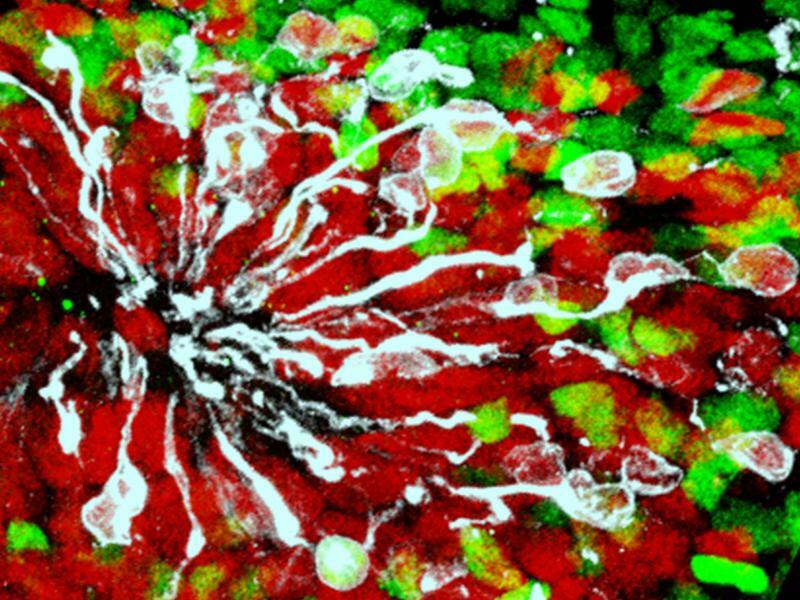 How do we understand the world we live in by our visual system, by our eyes? How do we recognize a car? How do we recognize a person? How does recognition as such work? The second part — which I also find very interesting — is memory. How is memory stored? We all know that we can memorize things even after decades. You have whole movies stored in your head. We know that’s very hard to do. So how does that really work? 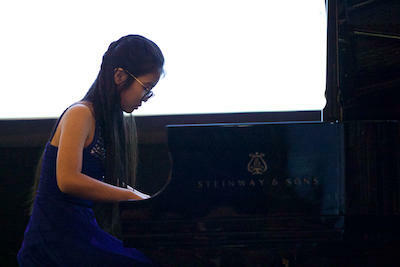 Guests enjoy a performance by pianist Lylybell Zhou during the first Science Meets Music event of the 2017-2018 season at Max Planck Florida Institute for Neuroscience in Jupiter on Dec. 11, 2017. Zhou is a junior at Alexander W. Dreyfoos School of the Arts in West Palm Beach. Is there any idea of what could come from this research, say, advancements in curing certain brain diseases, or a new kind of visual technology? That is, of course, the long-term expectation. But it’s not that easy to say, we do this type of research today and tomorrow we have healed Alzheimer's because that’s one of the most complex diseases we have. If you really want to understand and to cure the main brain diseases which we have — Alzheimer’s, Parkinson’s and many others — the only way to do it is to deeply understand how that organ really functions. The events begin at 6:15 p.m. at The Benjamin Upper School, 4875 Grandiflora Road in Palm Beach Gardens. For more information, visit their website here. 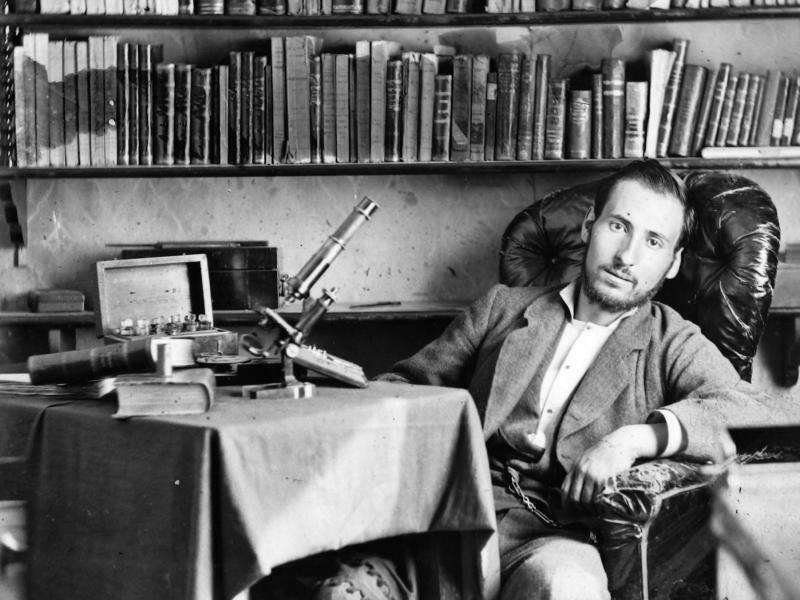 What Einstein did for physics, a Spaniard named Santiago Ramón y Cajal did for neuroscience more than a century ago. Back in the 1890s, Cajal produced a series of drawings of brain cells that would radically change scientists' understanding of the brain. And Cajal's drawings aren't just important to science. They are considered so striking that the Weisman Art Museum in Minneapolis has organized a traveling exhibition of Cajal's work called The Beautiful Brain. 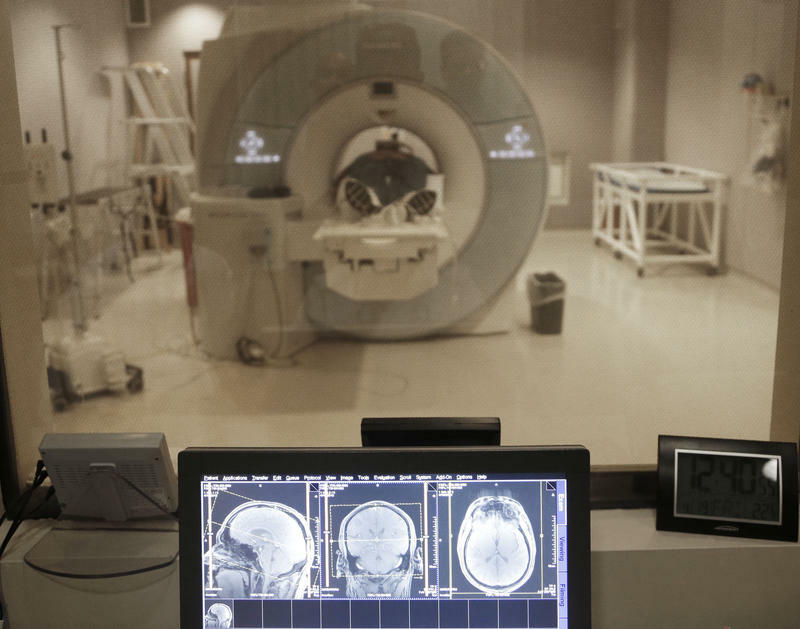 The National Institutes of Health announced a $16 million grant to researchers from Boston University and other institutions trying to find a way to detect a disease believed to stem from repetitive trauma to the head.